What an exciting era for college football! Globalization, which began with soccer-style place kickers, has taken the next step forward with rugby-style punters, and hurry-up spread offenses are producing basketball-esque scores. It seems a pity that the one thing we can rely on — that one thing that never seems to change in an ever-changing world — is just how bad Pac-12 officials stink. 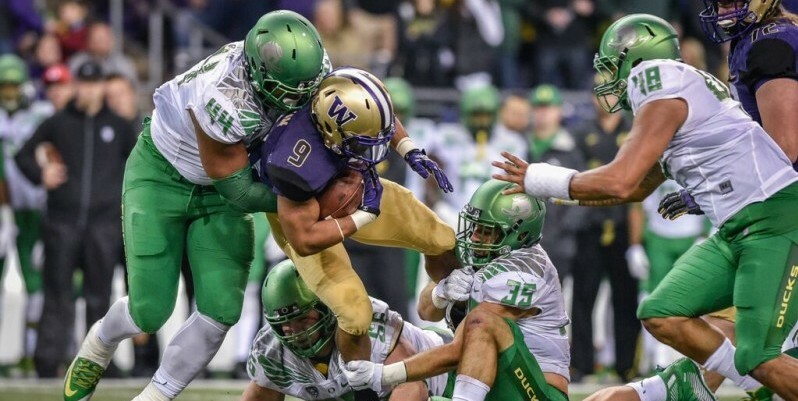 Rugby punters, the hurry-up spread offense and the “entertaining” Pac-12 officials are the subjects of this week’s Three-and-Out. 1. Rugby-style Punters. The few times Utah had to punt against Oregon a few weeks ago, the Utes’ Tom Hackett pinned the Ducks deep with rugby punts that would probably still be rolling if the coverage men hadn’t downed the ball inside the five yard line. Utes watch another Hackett punt roll. Hackett was at it again against the Arizona State Sun Devils, averaging 46.9 yards per punt with a long of 58 yards — and he wasn’t alone. Michigan’s Blake O’Neill got one off for 80 yards against Michigan State. When your defense forces a punt from inside the 20, you’d expect some decent field position — certainly not a start from the shadow of your own goal posts. But the low rollers are hard to field and once they make it past the return man they can roll forever. There is some risk. Without the hang time, a cleanly-caught rugby punt can result in a solid runback. The Sun Devils returned one Hackett punt for 48 yards. Still, the stats on the rugby punts look pretty good. There was a day when kickers booted the ball straight on with the tip of the toe. Then the soccer-style kickers — at first a novelty — came along, and now you never see a straight-on kicker. It makes you wonder if we will see the same thing with punting, with the rugby guys taking over. It also begs the question of what changes we might see in the return game. 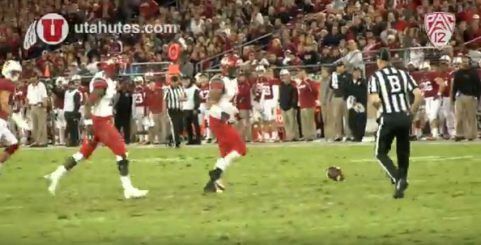 There’s probably a limit to the tolerance coaches will have to watching punts roll 30 and 40 yards along the ground. There was also a day when two return men — one left and one right — was fairly common on punts. It seems that two return men — one shallow and one perhaps 20 yards deeper — might be a deadly combination against the rugby punter. If the first one catches it on the fly he’s got a short, low-trajectory kick to work with, and if the kick rolls, the deep man has a punt that has overshot its coverage, plus a blocker in front. 2. The Hurry-up Spread Offense. This offense is absolutely deadly when the defense is on its heels. Needless to say, it’s a black eye when an offense goes three-and-out. Somewhere between defense on its heels and three-and-out, there’s a dividing point where the advantage shifts between running it and not running it. Over the past few years the Ducks were definitely on the advantage side of the line. This year? Perhaps it depends upon who they are playing — and who is in at quarterback. Against the Huskies, the Ducks actually had more time of possession, roughly 31 minutes to 29. Even with the slowdown at the end, though, the Ducks did run plays faster — about 24 seconds per play to the Huskies’ 29 seconds. And the Huskies’ inability to move quickly at the end of the game certainly did them no favors. 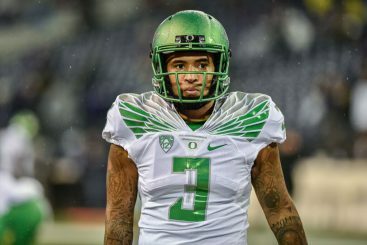 Oregon’s offense improved with the return of Vernon Adams and a deep threat. As more and more teams utilize the hurry-up spread, defenses will adjust — some better than others. And if the offense can’t get the defense on its heels, then hurrying is in vain. Stanford has made a living by being old-style pro, and this creates an advantage since it’s different from what defenses see most. A wholesale return to huddle-up pro style seems unlikely, but the time will probably soon come when offenses need to come up with something new — or with a blend of some things old — to gain an advantage, particularly when personnel does not match up well for hurrying it up and spreading it out. At this point, Oregon seems to be in an awkward gray area where it’s just hard to know whether putting the foot on the accelerator is going to result in surging forward or spinning out. 3. Pac-12 Officiating. There was 8:57 left in the game with Oregon up 26-13 when the Huskies began their final successful drive of the game. With the ball on the Washington 29-yard line, DeForest Buckner and a host of Ducks corralled Washington running back Myles Gaskin for no gain, pushing him back, pushing him back … until the yellow hankie came out. Action after the whistle? You bet. Did the Ducks hear the whistle? Who knows? Had the Huskies been doing the same thing all night? Oh, yeah. It’s not that it was necessarily a bad call. But it was inconsistent with the way the officials had been calling the game — and it came late, apparently in response to the home crowd. It seemed a move either to appease the homers, or possibly to make the game more interesting. Later in the drive, with the ball at the Oregon 13, Tyson Coleman sacked Washington QB Jake Browning on 3rd-and-8 for a 15-yard loss. He also stripped the ball, which the Ducks scooped up and were running back for a certain touchdown. But the officials had already blown the play dead (incorrectly), ruling that Browning was down before the ball came out, which he clearly was not. At this point, who knows whether it’s just the officials doing their part to provide entertainment by keeping games interesting or whether it’s simple incompetence? Either way, perhaps competence is a bit much to ask for, but we should at least get consistency.